Year after year I greet students and families as they come to meet me and see the classroom at Open House. The first question I hear students ask their parents is, “Are my friends in this class?” This is a valid question, after all, school can be difficult! We all want friends nearby to love and support us-including me, the teacher! Not every student gets to be with their very best friends every year and “getting to know you” activities are an excellent way to help students make new friends, or deepen older friendships! I found an awesome activity through Mailbox Gold to help students get acquainted. 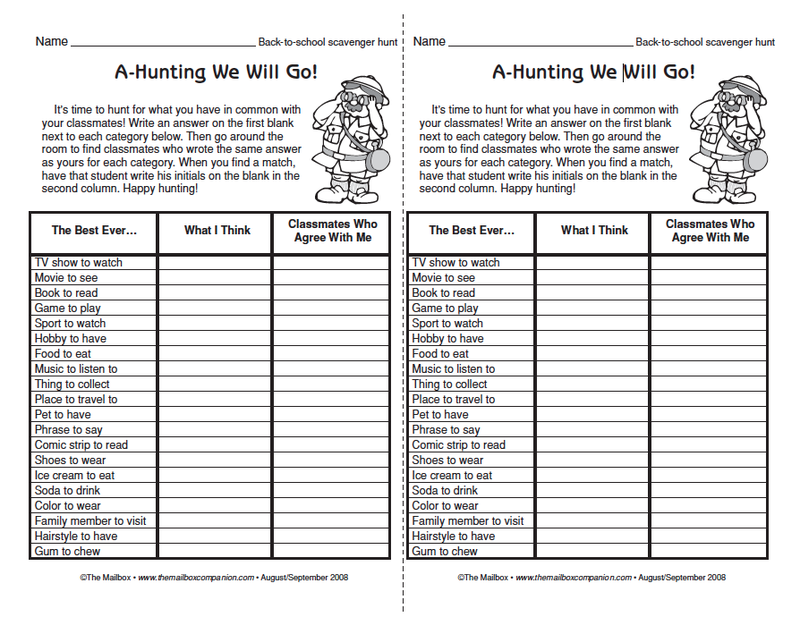 The activity is called, “A-Hunting We Will Go”. It is recommended for grades 3-6, so it is perfect for my fourth graders! I will be using this activity on our first day of school. The object is simple: students fill out the chart with their own opinions and find someone who agrees with them. For example, my favorite family member to visit is my sister. When I do this activity with my students I will be looking for someone who also wrote, “Sister” in the box provided. I love activities like this because they help the students feel more comfortable with each other and with me. I previously taught third grade and am looping up to fourth grade with about half my class. This activity will certainly let our new friends get acquainted and help me learn even more about the kids I already know! You can plan easier, too! Go Gold. What “getting to know you” activities do you have planned or have you done? Leave your ideas in the comments below!